It looks better than the X6. I agree; not many around in UK......but then are we really in Europe?? i would really like it if the real model comes out like that. although, i would probably have a tough time getting over the fact that its an X4. Sorry Palbay...old video showing the X6 prufcubing. Look at the shock tower design. BMW CEO Norbert Reithofer in an interview with Auto Motor und Sport announced the construction of a new SUV. After the success of the X6, it would be above the X3 is another model. 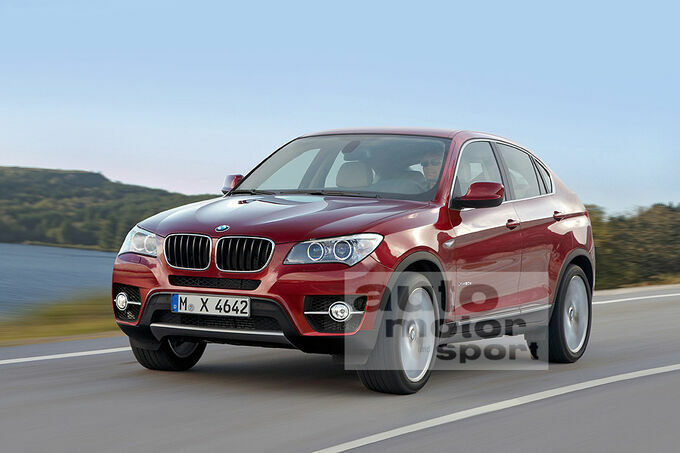 "Yes, we are positioned above the X3 a BMW X4," said Reithofer. The new SUV will be about 4.65 meters long and take the X3 engine range (184 to 306 hp). BMW X4 is equipped with four-wheel drive, automatic start-stop, head-up display and voice control. Since the BMW X4 coupe-like but clearly is as the X3, the trunk falls with a volume of about 500 liters of significantly less than its smaller brother. Well. it's OK-ish. I still think the X6 looks much better though. This X4 might just be the flop that the X6 hasn't been. The back just doesn't quite look right, but I can't pin down exactly why. Maybe it's because as an X6 Owner I'm used to that shape. Given the choice I'd rather have the X3 on this platform than a wannabe X6. I do like the new X3 a lot, but can't justify the cost as we already have an X6, a 3er and a Mini Countryman SDX on the way. The mini is replacing our 2005 E53 as we just don't need an X3 size second/third car any more. Not that I stand a chance of getting SWMBO to let go of her E46 330Cd Convertible. Last edited by X5Sport; 09-28-2011 at 08:51 AM.